shot by @milloux , but it took me a little bit longer to get together the comments I wanted to feature than I anticipated, and was busy prepping for a change of hair color! Going Green! But that's not the point of this blog, the point of this blog is that YOU GUYS ARE AWESOME!!! You all left such amazing comments and love to my new set I had such a hard time choosing ones to feature. 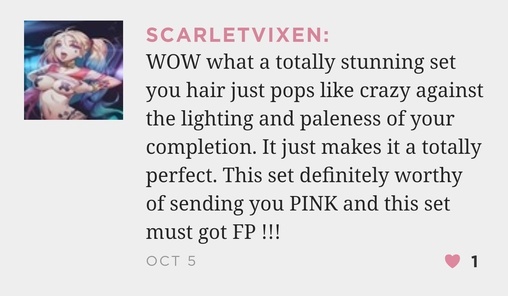 So please know I've been reading all your comments and praise of A Blossom Fell many times over and am so greatful for all the support and love on this set, and none of your comments have gone unnoticed! @sleuth - I actually had to message this babe because her comment was so sweet I wanted to thank her directly! Be sure to check out this babes sets! 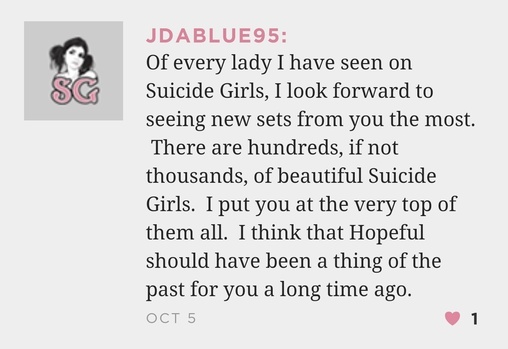 @jdablue95 Holy cow this comment was definitely one that made me literally "ahwwwww" out loud, I appreciate everything you said so much, and am giddy to be considered a favorite SGH of anyone! @big_volts As I said in the previous comment, I'm absolutely taken-aback to be amongst anyone's favorite ladies! Glad I could contribute to the birthday festivities, without even realizing it! Happy belated birthday! @Maleh I was actually totally taken aback by this comment and got a little blushy even at the thought of my set having everyone tagged to it (x But thank you so much lovely! 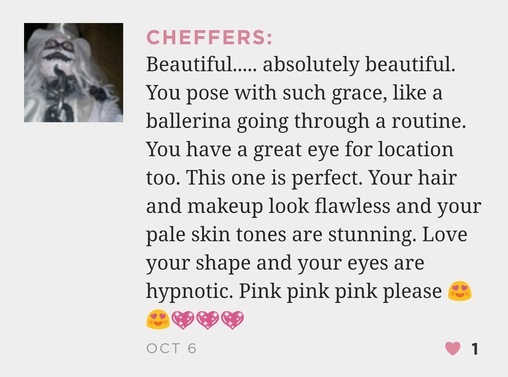 @eccentricrecluse Such a thoughtful and lovely comment, I appreciate very much! @tallman75 Thank you for the love!!! the lovely @rebeccarose definitely knows about looking magical, so was lovely to read this from such a babe! Ahw @teddydee333 your comment made me "ahwwww" out loud as well! <3 So sweet, fingers crossed one day I will be! My giiiiiiiirl @insatiableindica <3 So much love for this lady! @saga a MEGA babe I have admired for a while now, and I about died to see you comment!! @gargoyle6972 Thank you so very much! I was stoked to find an outdoor space, as originally planned for indoor! This blog shows what an amazing woman you are! Thank you SOOO MUCH for all the Love on A Blossom Fell! I just reconnected my IG and had like 5 old posts go up all together, SOOOO Sorry if you got flooded on your dash!! Great set. You are always so gorgeous! In Full Bloom is SOOOO Close to 2600 Hearts!!! Stoked for this multi with the beautiful and babely @evahunter and shot by Black Rabbit Photography You aren't gonna wanna miss it! ;) And we're already planning another multi of the cosplay variety together! What color(s) should I do my hair next? Been thinking of going back pink for a bit..
Use your creativity! I see purple! My new set by @Milloux is AMAZING, I can't wait for you all to see it! !